Galder, Hernan, And Ivan Are Out Of Control! "Get down from that tree!" I yell as Hernan follows Galder up the old oak in our neighbor's backyard. Ivan giggles from the topmost branch, dangling his feet in victory. "Mr. Ortiz doesn't want you up his tree. Get down now!" They boys don't listen - they never listen. After years of chasing my sons through mud, small streams, up trees, down hills and... you name it, I've chased them through it... you'd think I would be used to them not listening. But I'm not. I can already hear myself going hoarse. "I'm serious Hernan, Galder, Ivan! Get down right now, or I will throw out the XBox. I mean it!" Hernan and Galder reach the top, thick branch that casually bounces as they sit next to Ivan. They whisper to each other, then Galder shouts, "What Ma? I can't hear you from up here?" A gust of wind rustles the leaves of the tree as if aiding Galder's claim. The branch slowly bobs up and down, enough to make my heart beat a little faster. I swear the tree taunts me. The door to Mr. Ortiz hundred-year-old house creaks and whines as he opens it with the snail's pace of an eighty-year-old man. He sticks out his cane first, followed by his right foot and then his left. He stands on his backyard porch and inspects the situation. His head shakes, as he always does, when he spots my boys in his tree. In Spanish, Mr. Ortiz tells me how I have no control over my sons and that they should learn to respect elders and private property and a list of other things I miss as I start to ignore his tirade. I apologize. He doesn't accept, and we dance about as usual until he decides it's enough and heads back inside, claiming the tree will become infected with children's germs. Once Mr. Ortiz goes inside, I shout at the boys. "I will count to three and if you don't come down right now I am getting rid of the XBox." Galder giggles. "What Ma? I can't hear you!" I can't rub my forehead hard enough. My blood pressure is dropping. I march to the base of the tree and yell at them once more. "This is Mr. Ortiz's tree and he wants you to stop climbing it." "I swear if you don't come down that tree right now, I will throw away the XBox, Wii U, and the Sony Play Station. I'll throw them all away. You won't have anything to play with ever again!" Galder looks at his brothers and then turns back to me and says, "Okay Ma. We'll come down in five minutes." And they go about their whispering as if I wasn't standing at the base of the tree waving my arms frantically and screaming like a mad woman up at them. I storm inside the house and close the backyard door behind me. With angry energy, I grab a box from the basement and quickly load it with the game consoles from the family room cabinet. Wires get loose and fall to the ground behind the cabinet as I disconnect each box. I've had enough of idle threats. I don't condone spanking, but I do condone psychological warfare and manipulation. This will teach them the price of disobedience. A few minutes later, Galder, Hernan and Ivan all walk into the house, laughing about how Hernan squealed like a baby pig when Galder shook the branch beneath him. I walk into the kitchen with the box in my hands, closed so they wouldn't see its contents. Hernan hugs me, followed by Galder and Ivan. "Sorry Mom," Galder says. "I wish we had that tree in our backyard. It's so awesome." Guilt begins to set in. I take a deep breath as I hold the box above the boys' heads. The three of them let go of me - I'm already missing their apologetic hugs. Galder grabs the gallon of milk from the refrigerator as Hernan pulls out plastic cups from the kitchen cabinet. Ivan hands me a bag of chips to open. "It's such a cool tree, Mommy," Ivan says. "I'm the smallest and I climbed to the branch first! Even Galder couldn't catch me!" "Mr. Ortiz is so grumpy. Why doesn't he just let us play in it?" Hernan asks. "Does he think we're going to break his tree?" "No," says Galder. "Mr. Ortiz doesn't like kids. He's a grumpy old man." "Then people who don't like kids shouldn't have an awesome tree." "That should be a rule... no... a law. If you don't like kids, you can't have a tree in your backyard. 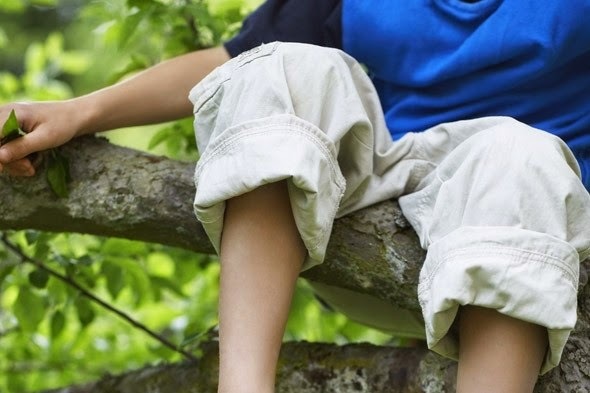 Or, if you do have a tree in your backyard, then you can't stop kids from climbing it." "Yeah," Ivan takes a sip of his milk, and all three boys are enjoying a snack as my sanity begin to regain control. I place the box on a stool and take a few breaths. The problem isn't that my kids are out of control; the problem is I let Mr. Ortiz's unreasonable restrictions work me up to a frenzy. We have connecting backyards. Mr. Ortiz has a fantastic oak with thick, sturdy branches. My six, seven and eight-year-old sons are just kids climbing a tree and having fun. "Boys," I say, feeling more at ease, "you have to learn to respect Mr. Ortiz's wishes. If he doesn't want you in his tree, you can't go up there." Ivan puts down his cup and with milk lining his upper lip he says, "But Ma, it's such an awesome tree." "Yeah, Ma," Hernan says. "Can't you talk to Mr. Ortiz?" All three boys pause and stare up at me with hopeful eyes. The clock tic echoes in the kitchen as they wait for my response. "Okay, I'll talk to Mr. Ortiz later and try to convince him to give you some time on the tree, but it's up to him. Understand? He decided who can and can't go up his tree." The three of them bounce in their seats, their legs swinging with delight as they eat their chips and finish their milk. Galder gets up and places his cup in the sink. "Okay, Call of Duty or FIFA 15?" he asks. "Call of Duty," Ivan yells. "I get player one! Please, please, please!" The boys discuss the setup as they walk to the family room. As I clean up the kitchen table, I hear "Hey! Where's the XBox console?" Damn. How do I explain what I did without explaining why I did it? Oh, I know. Lie. "Oh... I was cleaning out the family room and had to disconnect the consoles to get all the dust out." A collective groan emanates from the direction of the family room. The three of them come filing into the kitchen. "Why don't you guys go outside and play. It's a beautiful day." Galder shrugs his shoulders and walks out the patio door. "Okay, but don't get mad if we wind up back in Mr. Ortiz's tree." His two younger brothers both shrug their shoulders and follow Galder outside. I take the box to the family room and painfully unload the consoles and begin the reconnecting process. It's going to be a long afternoon. This reminds me of my oldest. He's constantly climbing...everything!